Real recipes for real people, living life in real time. Some thing in life are so good, there’s just no putting them into words. Some foods are like that too, and this is one of those recipes. So good , and wholesome and the tastes, the combos of flavor, intertwine so well. I worked with a Italian Chef once named Dominico he had a real talent, a flair for combining flavors, where it was like nothing else you’d ever tasted. Not your run of the mill Italian food, and I picked up a lot from him even though I was a bartender, and server, not actually working behind the line. Turns out if he wasn’t there, and a customer would order a certain dish, the cooks would come to me and, I’d jump behind the cooks line for a minute get the dish ingredients together for them, throw them in a pan, and continue working on the floor, while giving step by step instructions, as they went along, while doing my “rounds”, which meant checking my bar customers, cruising thru the dining room for dirty dishes, filling empty glasses, always with my hands full, going in and out of the kitchen, making my way to the dish pit and finally back to the food window where I could check on the progress of “said meal” in the making, barking instructions jokingly as I went, like “more pesto, it’s not green enough, they’re not cats, they don’t want a bowl of cream!”Everybody knew this was all in jest, and just my way of keeping thing running smoothly, and I’d make my rounds again! I apparently was the only other person in the whole restaurant, who watched him so closely when we were slow, while he was cooking, and because I’m such a sponge remembered all the intricate details of these dishes. Even the cooks? And consistency is so important, if I like a dish and go back for it again and again, I want it to taste the same as it did the time before! Who knows why, I just watch people and learn so easily when it comes to food, that by the 3rd trip to eat sushi, (at a sushi bar, instead of a beach in Hawaii), at 15, I was able to go home and recreate it, same with Thai, Mexican, Cuban, Italian, or anything else you put in front of me. And oddly these, sensory awareness memories are never far from the frontal lobe of my brain, as a smell, or a taste, or a mention, can evoke these memories on the spot. I feel very fortunate to have this ability, and use it to my advantage every chance I get. I haven’t made Stuffed Shells in years but something on TV, sparked the memory and so I decided to go for it. Dominico was a strong believer in not over seasoning, making one flavor blend into the next, with a subtlety to the effects of what ingredients he would use, coming out perfectly I always follow this rule when cooking Italian, not to over power, taking away from the overall culinary, delicious, flavor experience. This is a great meal, Enjoy! And if you’re a vegetarian, Portabella Mushrooms done the same as the Chicken, are delicious as well. Or this is plenty filling to stand on it’s own, perhaps with a side salad! This dish can also be made 24 hrs in advance, just cover and put in the fridge until about a hour before you’re ready. 10 oz. bag of frozen chopped spinach, thawed and put in a clean dish towel, and wrung out, getting rid of all the water. Under cook pasta, by about half, where its pliable but not done, reserving 3/4 cup of pasta cookingwater. pull one out to check, run under some cool water and see if it’s done enough to open and stuff. Drain Pasta and run under luke warm water, cold will make it harder again. Have ready a 13x9x2″ pan grease the pan with Olive Oil. Stuff shells with spinach/cheese mixture, don’t be shy, fill em up, you may have shells left over, but your pan should be full of stuffed shells, lined up neatly, cheese side up! 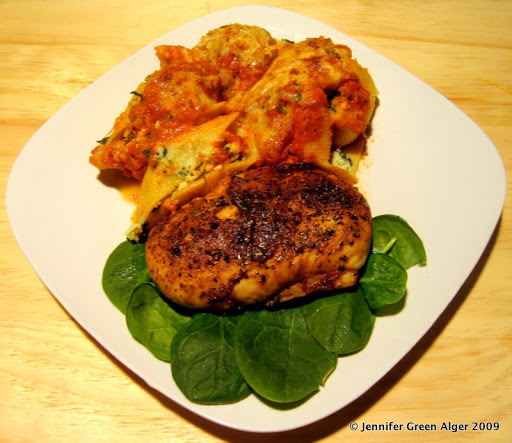 Mix well Marinara, with reserved pasta water and pour over stuffed shells, cover with foil. Set aside. have ready, Italian seasoning, black pepper grinder, salt or seasoned salt, I like the cajun, and it won’t clash. Trust me. Pour carefully some more dressing on top of chicken, and quickly, sprinkle all, with spices listed above. 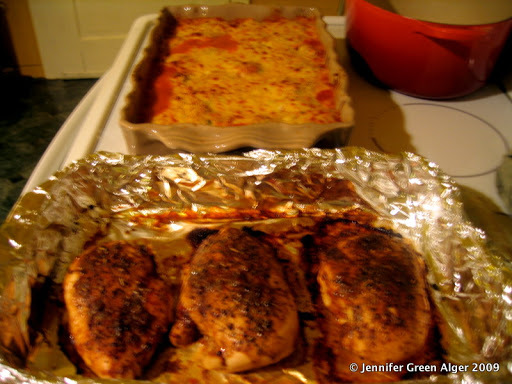 Put the chicken uncovered in the oven on the middle/low rack, and the pasta covered on the top rack. parmesan cheese about a 1/2 cup. 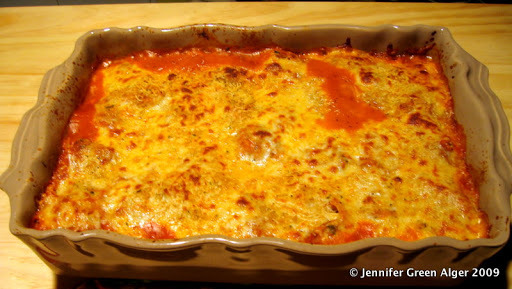 Put back in oven to melt cheese, 5 minutes, and then under broiler for 1-2 minutes to lightly brown top! Remove and let rest 5-10 minutes to set. 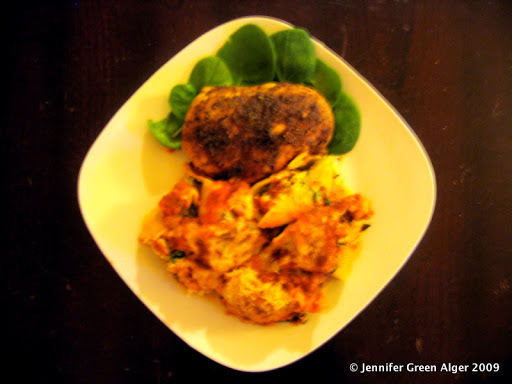 Serve with a piece of chicken, on a little bed of baby spinach or field greens, for garnish. Thanks… getting it back on track! This looks so delicious! Great job!